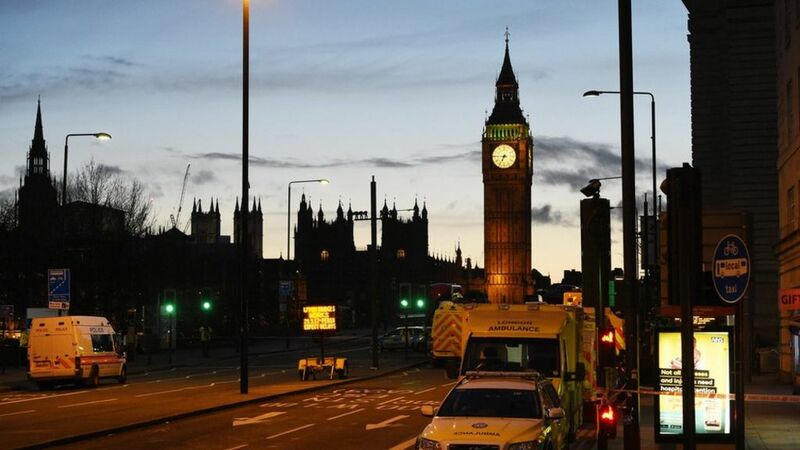 Leaders of countries affected by recent terror attacks have voiced solidarity with the UK after the deadly attack near the Houses of Parliament. A lone attacker was shot dead after he used a car to run down pedestrians, killing two, and stabbed a police officer to death outside Parliament. Leaders of France and Germany, which suffered deadly vehicle attacks last year, offered the UK their support. The US president offered condolences and praised UK security forces. There is a mixture of nationalities among the dead, police say, and 29 people have been treated in hospital, of whom seven are critically injured. Among those injured by the car on Westminster Bridge are three French schoolchildren and two Romanians, while five South Koreans were hurt in the chaos that followed the attack. President Francois Hollande expressed his “solidarity” with the British people, saying “terrorism concerns us all and France knows how the British people are suffering today”. In July last year a man drove a lorry into pedestrians in the southern French city of Nice, killing 84 people. The attack was claimed by the Islamic State (IS) group. German Chancellor Angela Merkel, whose country saw a lorry attack in December that killed 12 people in Berlin and was also claimed by IS, said her thoughts were “with our British friends and all of the people of London”. “I want to say for Germany and its citizens: We stand firmly and resolutely by Great Britain’s side in the fight against all forms of terrorism,” she added. US President Donald Trump spoke by phone to British Prime Minister Theresa May to offer his condolences and to praise the effective response of UK security services. Mr Trump pledged the “full co-operation and support” of the US government in bringing those responsible for the attack to justice, the White House said in a statement. Belgium’s prime minister sent a message of support as his country marked the first anniversary of the suicide bomb attacks on the Brussels airport and underground system, which killed 32 people. European Commission President Jean-Claude Juncker said in a statement that the people of Brussels and Belgium had “suffered a similar pain and felt the support of your sympathy and solidarity”. Russian President Vladimir Putin also sent condolences by telegram to Mrs May, expressing support for the bereaved and wounded. “The forces of terror are acting more and more deviously and cynically. It is clear that, in order to counteract the terrorist threat, all members of the global community must combine forces,” he said. But not all international reaction was so reserved, with some right-wing politicians suggesting that controls on immigration – or even all Muslims – was the way forward. It has subsequently emerged that the attacker was born in Britain. “It’s #Pray4Muslimban. Put a ban on it, that’s how you solve the problem, and then let’s deal with the issues here,” she said. In France, National Front leader Marine Le Pen, who is campaigning for the French presidency, said the London attack showed the need for borders to be protected. She told French media that security measures needed enhancing amid a rising threat from “radicalised personalities who act alone without networks”, and urged countries to co-operate with each other on sharing intelligence. Poland’s Prime Minister Beata Szydlo said the London attacks justified the country’s policy of refusing to take in refugees. “I hear in Europe very often: do not connect the migration policy with terrorism, but it is impossible not to connect them,” she told private broadcaster TVN24.